Truly an amazing endeavor. 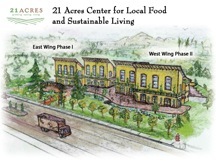 21 Acres is a non-profit organization focused on locally grown food and sustainable living. Click here for their story. 21 Acres is also a piece of land in Woodinville, within walking distance to city hall and downtown, formerly known as the Kaplan Farm. 21 Acres was purchased in the late 1990’s by King County Parks and Natural Resources. Friends of the Woodinville Farmers Market purchased the land from the County for $352,000 in January, 2005. 21 Acres is part of King County’s Farmland Preservation Project. A small portion of the land is being prepared for an innovative sustainably designed building called The Center for Local Food and Sustainable Living. This will be home to a year round farmers market, community kitchen, and classrooms for community education. With it’s 50 kW PV solar panel array once up an running the building will be powered by the sun. Saturday, June 6, 10:30 a.m.